Variances up to 1/16" (1.5mm) from your speaker measurements are OK. I used this foam kit to repair the deteriorating surrounds on a Logitech Squeezebox Boom. The Boom has developed a habit of torn woofer surrounds after a couple years of use. I own two such units that both needed repair, as they both started showing tears in the same month. Two of these kits and a couple hours of work on each unit later, and they are back to sounding as wonderful as they did from the factory. Disassembly of the Boom itself it probably the trickiest part of this task. The speaker repair just take time and patience. These are not an exact fit for the originals (the outside diameter is a little smaller than originals), but they're about as close as you're going to get. Just be sure to center the foams really well on the cone when gluing them on, and there shouldn't be any issue with attaching the surround to the basket edge. I used 3M automotive adhesive remover to soften up the original glue on the cone, and a straight razor to scrape down the remains of the original rubber surround on the edge of the basket. Considering the cost of (and how much I love) the Boom, this kit, and the time it takes to install, is well worth the money to extend the Boom's useful life. I have these original Apple speakers from 1994 that were starting to crackle when played. As I am technically inclined researched how to replace the original speakers when I came upon Simply Speakers and ordered what I thought was the correct size, which when received was not. The tech support at Simply Speakers were very helpful and shipped me the correct repair kit. They did not ask for the return of incorrect size, which I shipped back to them anyway. Within two hours after receiving the kit my speakers were repaired and sounding better than the original. Thanks so much for the repair kit and friendly tech support for a quick and inexpensive repair. The kit was received quickly. 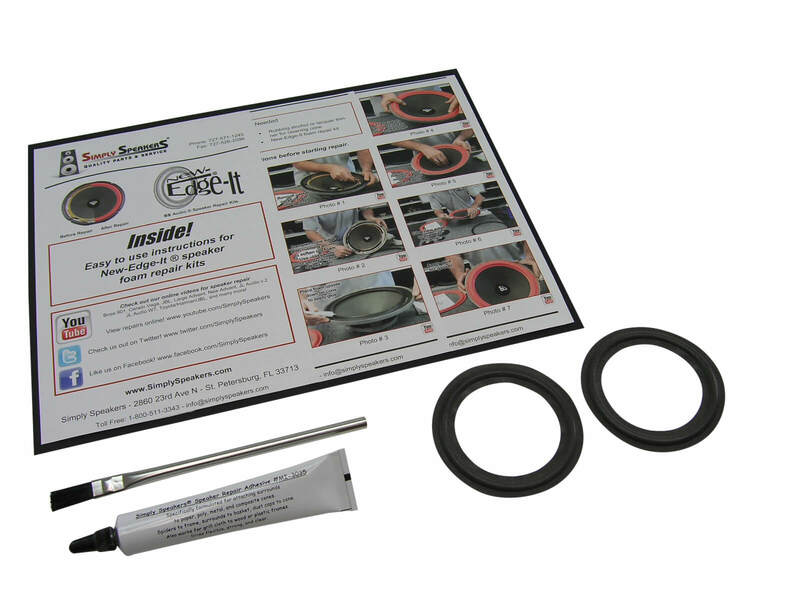 The instructions were easily understood and the edge kit installed without issue. This definitely is the way to save vintaage speakers, rather than relegate them to landfills. Besides, if a speaker performs why not salvage it. 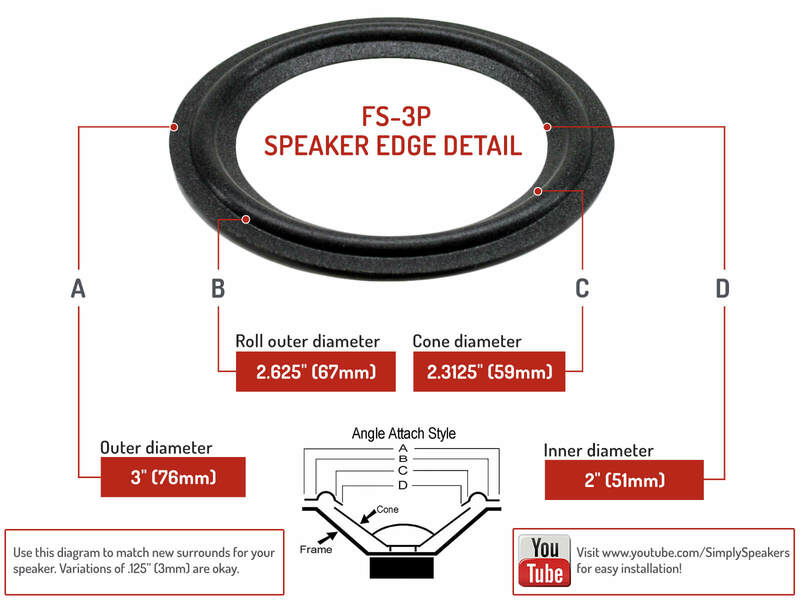 Purchased the FSK-3P Standard 3" Foam Speaker Repair Kit, FSK-3P (PAIR) in order to repair a mid range car speaker which was about 27 years old. 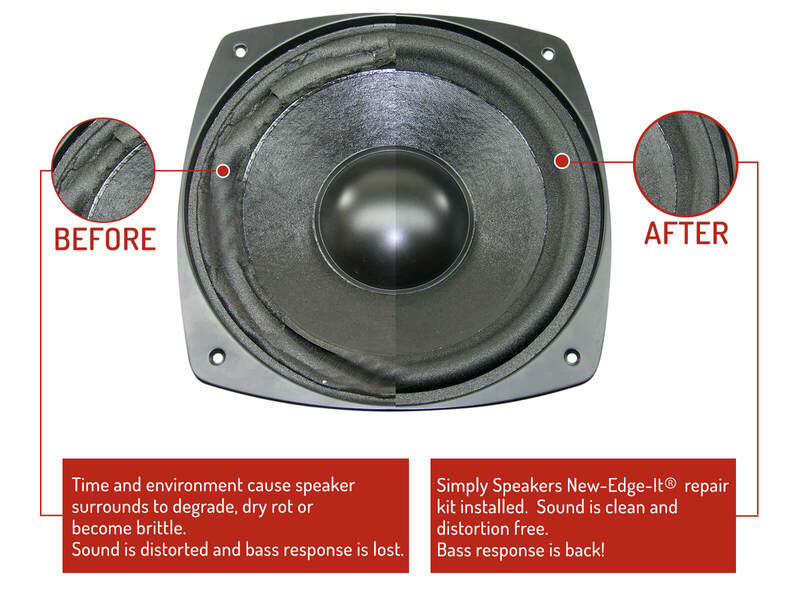 The foam material around the edge of the speaker had disintegrated over time causing the speaker to buzz. The repair was easy, and the improvement dramatic. I'm now enjoying the sound quality closer to the original experience. I normally would have tried to replace the speakers but the size and placement did not allow for a new speaker option. Thankfully this worked. The 3" foam kit neatly repaired my beloved little A2's, which I thought were 'blown' and needed replacing for $260. No trimming or custom fitting of the foams was required, they bonded right in. Kit worked well, instructions were good. Application was for Squeezebox Boom. Hardest part is cleaning off the old adhesive. Reconditioning a 4" speaker took a little guts but the Squeezebox Boom is now sounding as good as new. This kit included everything to bring the Boom back to life. Many thanks. I purchased a classic Porsche 911 only to find out that the original speakers in the car had destroyed foam surrounds. Being that I wanted the car completely bone-stock, I wasn't about to replace them with aftermarket speakers, so I started hunting around for the originals on eBay. Needless to say, they were not available anywhere due to their oddball 3 inch size (not 3.5 inch), so I thought I was completely out of luck until I found Simply Speakers. These guys helped me to restore the original speakers with their 3 inch foam repair kit and the car now sounds as good as the day it came out of the showroom. Thank you Simply Speakers! You guys are a lifesaver! Q: Will this item be the correct size for a speaker whose cone at the edge measures 3 1/2 inches in diameter? A: No, for a cone diameter of 3-1/2", please order kit # FSK-5L. Q: I have some old 3" speakers. I measured the cone and it is 2-5/8" diameter. Will the FSK-3P kit work for these?